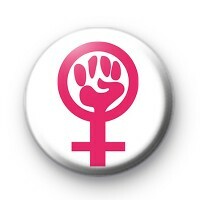 Symbol for Women's Rights 1 inch pin button badge. This bold pink and white badge is ! Stand up to discrimination and unite. Pro feminist badge and such a positive message to spread. Say No to Trump. Feminism badge.